Two less school buses combined with a season high 37 Hornet B cars and a number of intense races highlighted the night of Fabricland sponsored racing Saturday night at Saratoga Speedway as the season winds down with only 4 race dates remaining. 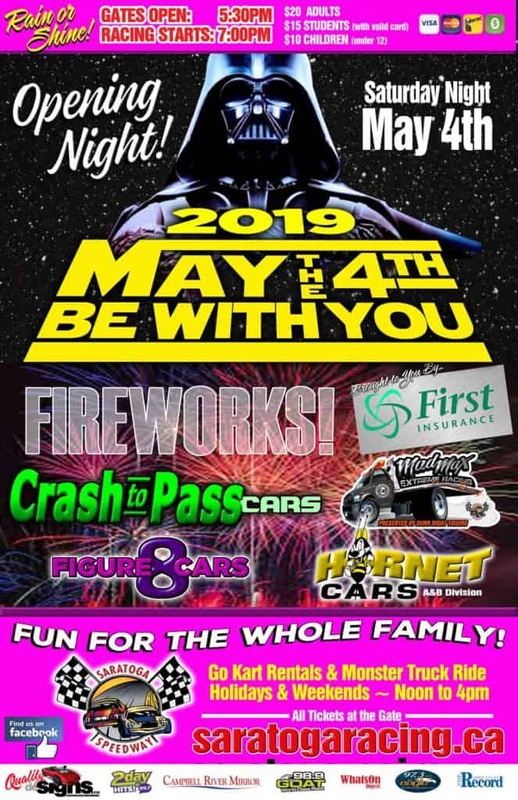 Six drivers in their first or second night of racing helped make up the biggest car count of the season in the Hornet cars with one of the drivers taking home two wins. Port Albernie’s Dillon Carlson in a race car for the very first time came away with win in his very first race in the 8 lap Hornet B C heat then pulled of the win in the 25 lap 18 car B main ahead of Jacob Ferrira and Austin Stevenson. The Hornet B A main saw 19 cars take the green flag with point leader Randi Joyce taking the win ahead of Taylor Pheaton and Nigel Neufeld with heat race wins going to Saje Kurpiela, Johnny Antonik and Barry Dunsmore who was also in his first race as was Skyler Carlson who won the trophy dash. In Hornet A action Campbell River’s Clancey Beamish won the 25 lap 10 car main event ahead of Ashley White and point leader Carter Hintz with White taking the trophy dash win and Hintz the heat race win. In Mad Max racing Brad Dimitrov won his 2nd straight main event after holding off a strong challenge from Damon Dunn who earlier won the heat race while Don Hallgarth began the night with the trophy dash win. The 15 lap Road Runner main saw point leader Ryan Guest and Austen Hack engage in a intense battle for the win with 5 laps of side by side racing with Guest taking the lead with one lap remaining to grab the win his 2nd of the night after winning the heat race. In Crash to Pass action Tom Dunn won the trophy dash and Chris Campbell the heat and main event. On the Black Creek oval this Saturday night have the Modifiedes running their 2nd last race along with the Bomber cars, Dwarf cars and the Road Runners Going into Saturday’s racing point battles have Chris Beaulieu 225 points ahead of Travis Stevenson while only 46 points separate Jeff Monks, Peter Mulion and Dano Byrant for 3rd in the Modifiedes.. The Bomber points race has Boston Larson 48 points ahead of Chad Taks and 110 ahead of Charlie Ackerman while in the Road Runners Ryan Guest holds a 67 point advantage on Austen Hack. The Modifiedes and Bomber cars return for the championship race September 23rd to finish of their 2017 season…The speedway is open Wednesday night for a practise session as well as the Go Karts and Monster truck rides will now be running only on the weekends from 12-4 until October 1st…..